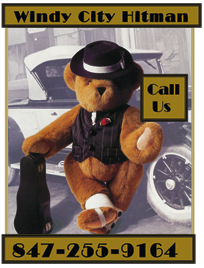 Each of our state-of-the-art sound systems are identical and company owned. The equipment is technically advanced so to produce clear, crisp, consistent and balanced sound without distortion. Each set up is clean and it is reliable. What you see is what you get. 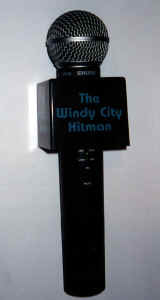 The Windy City Hitman DJs mix on Apple Computers instead of with CDs. We feature the Apple iMac G5, with a 17 inch screen, the most stable & user friendly computer around. It’s fully loaded with MegaSeg DJ mixing software, a superior application used by many radio stations nationally. Everything runs smoothly because the hardware and operating system are both designed by Apple, a synergy not possible with a typical PC. Quicker ability to instantly locate & play specific songs titles from the entire music library. An outstanding collection of titles, 35,000 plus selections, is brought to each event. 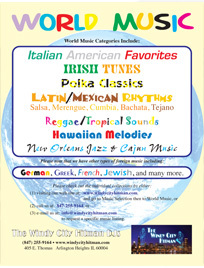 We maintain an updated and diverse music library. 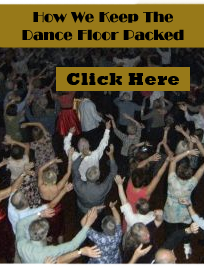 Lists of songs are conveniently categorized by type of music, title, artist, and year; great for playing musical sets, cocktail and dinner collections, theme parties, anniversaries, and reunions. 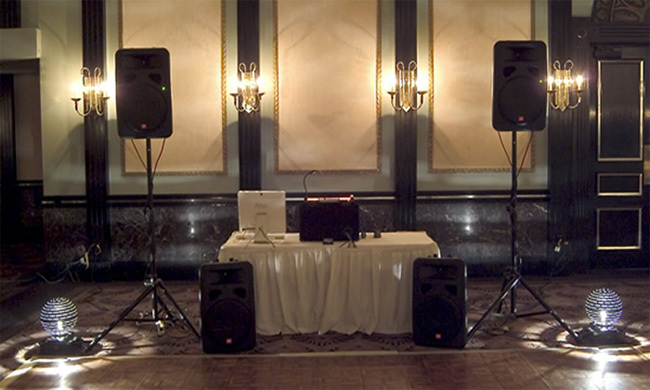 We have the ability to preprogram an entire celebration, from the cocktail music through the last dance as customized by our clients, while still allowing for the flexibility of the insertion of requests, skipping certain titles or just changing the order of songs during the party. Songs have been edited; to eliminate unnecessary long build up and drop off times. 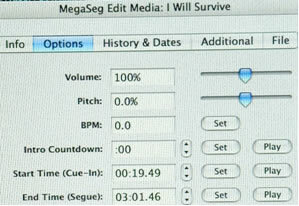 We trimmed off the first 19 seconds of â€œI Will Survive from the original version. Guests need to be dancing, not waiting and standing around for a song to gain momentum. Features also include advanced sound effects & real-time beat mixing to seamlessly blend between songs without any dead air time during transitions. There is now No chance for a CD to skip. It provides a clean & sharp appearance. No CD cases or large CD decks. Finally, digital technology frees up the DJ to be able to spend more time reading the crowd keeping the energy, excitement or romance going. 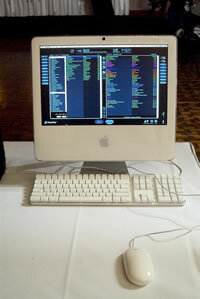 A second Apple Computer fully loaded with MegaSeg software & music is brought, to ensure confidence and peace of mind. 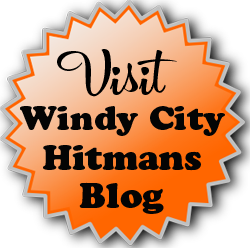 Unlike much of our competition we bring more than just an iPod or CD player as a backup. For quality, all songs have been tested ahead of time. The collection has been carefully transferred from original CDs at a high bit rate, insuring the integrity & quality of each song. New titles are continually added from either original CDs or from iTunes to maintain top quality. Advanced DJ Setup featuring the new JBL G2 self powered EON series speaker systems. New technically advanced, each individual speaker is driven by it’s own built-in bi-amped power for superior clear and crisp sound, balance of high and low frequency, flexibility & reliability. JBL is the audio industry’s most recognized and respected brand name producing equipment synonymous with precise naturally articulated sound in many of the world’s most prestigious arenas, concert halls and clubs. Our cordless microphones let us go to where the action is and not always have it come to us. 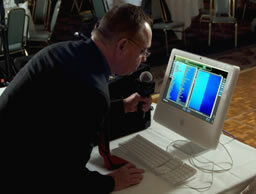 We can roam around your event all the while making the microphone accessible to our equipment.